Gold tumbled after Federal Reserve Chairman Jerome Powell opened the door to four interest rate hikes this year on the back of a strengthening U.S. economy, another instance of the competing forces that have corralled prices into a $65 range since the start of January. While bullion is under pressure in an environment where the global economy is recovering and interest rates are climbing, the reappearance of inflation, the prospect of wider U.S. deficits and a long-term decline in the dollar have lent support to the bulls. Gold held steady at $1,319.40 an ounce Wednesday after a 1.2 percent drop a day earlier. Here are five charts that show the quandary. 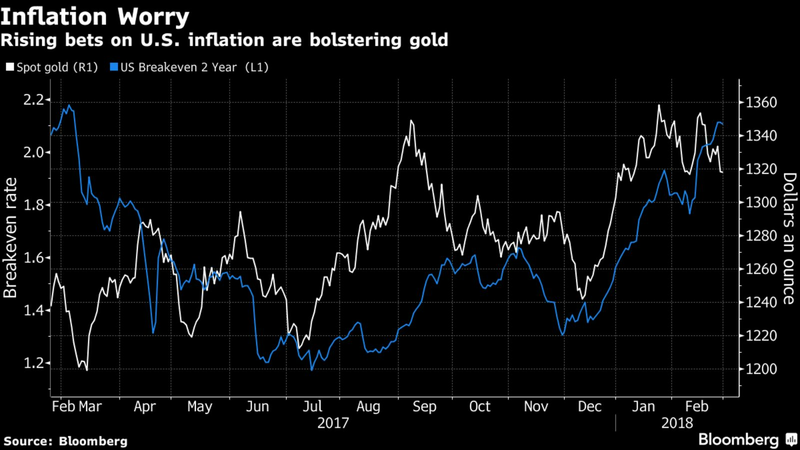 Higher inflation expectations due to rising oil prices have been supportive for gold, according to a report in February from Goldman Sachs Group Inc., which sees prices reaching $1,450 by the end of the year. Other drivers have been strong emerging market growth and some potential hedging demand in a choppy market environment, it said. JPMorgan Chase & Co. also says rising inflation will benefit commodities, including precious metals. While bond yields are rising and the Federal Reserve is set for further increases in interest rates, that may not necessarily spell gloomier times for gold. Bullion climbed during the previous tightening cycle in 2004-2006. Plus, the S&P 500 Index has doubled in the past seven years, and any prolonged reversal of the stock market boom could increase demand for gold. A sustained return to dollar strength would also be bad news for gold bulls as bullion has a strong inverse relationship with the currency. 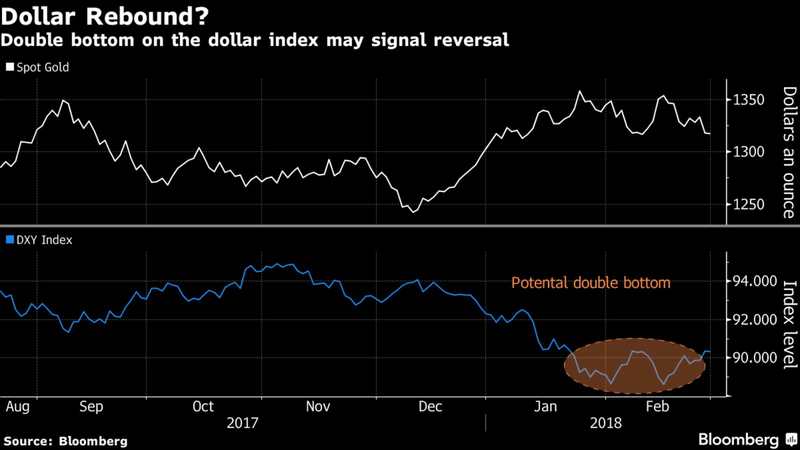 While the dollar has been languishing near the lowest level since 2014, a rebound since mid-month has created a double bottom, a key reversal pattern in technical analysis. A look at the performance of gold in other currencies may be sobering for bulls. 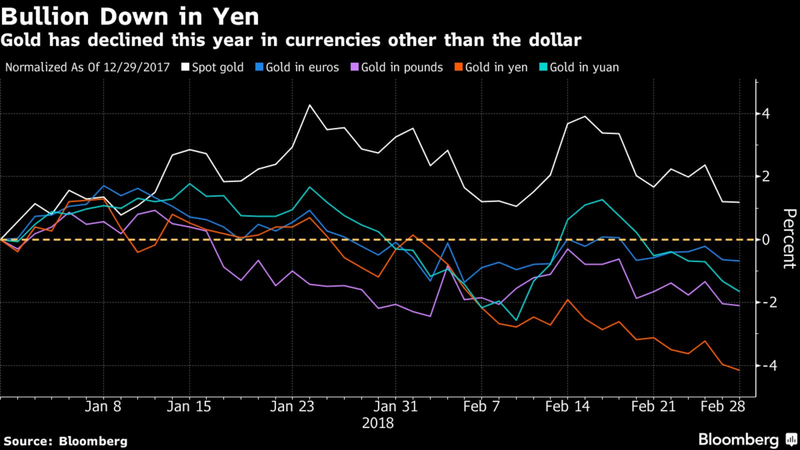 Take a look at prices in the euro, the pound, the yen and the yuan this year -- they’re all down. Simona Gambarini, commodities economist at Capital Economics Ltd., said Monday that according to their calculations, 50 percent of the change in the price since the start of 2018 is due to dollar movements. “If we stripped that effect off, the price of gold would be much lower,” she said. Capital Economics predicts $1,270 by the end of the year.